Global Warming: Quilts, Coverlets and Blankets, now on view in the Textile Gallery through September 17, came about as a response to the recent publicity over climate change, environmental concerns and extreme weather patterns. 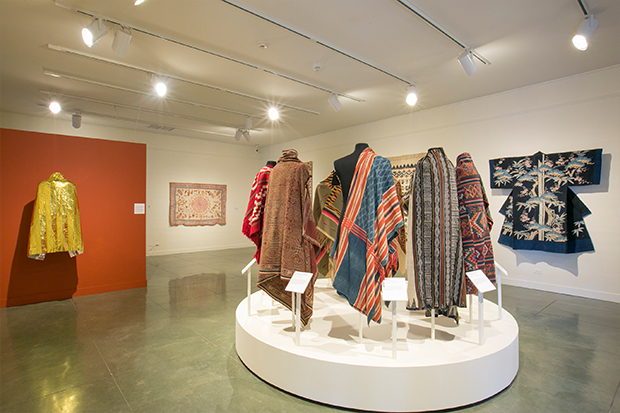 Addressing “global warming” through the lens of textiles and fiber, the collection revealed nearly 200 of the largest formats, mainly large squares or rectangles of cloth used as bedding. Selecting only a fraction to exhibit was challenging but necessary. Quilts and coverlets provide more than just warmth, security, and comfort, but are often charged with auspicious motifs associated with marital bliss, fertility, and long life. Because these large textiles are displayed prominently and can double as canvases to convey social status, many are coveted as dowry or heirloom cloths, passed down through generations. The mere mention of the word “quilt” sparks memories of one’s grandmother and emotional ties to family favorites. Many are appliqued, patched, and stitched—a graphic reminder that design and aesthetics play an important role in the end result. Deliberate strategies reflect the maker’s personality, from quiet restraint and carefully balanced geometries, to whimsical, often asymmetrical, imaginative scenes incorporating mythical narratives. Through the works, we can see how fiber choices highlight global styles and regional inclinations. For example, colder locations rely on wool—scientifically proven to have insulating characteristics for trapping tiny pockets of warm air, even when wet. From Guatemala, Mexico, and Bolivia, to Tunisia and Bhutan, the treatment of wool from sheep and yak varies from finely spun to roughly felted—each representing a distinct tradition. Religious symbols, animal silhouettes, flowers interspersed with woven geometries are recorded as local lore of adornment. Warmer districts utilize cotton, a cellulose fiber, recognized for comfort and ease of care. Recycled cloth is layered for added warmth, but often stitched to create pockets for trapping air, a key factor for retaining heat. Hawai‘i’s own kapa moe, large sleeping covers, are made from the beaten inner bark of wauke, or Broussonetia papyrifera. These five layers are stitched together, bound as a book, so one could peel off each layer according to the temperature. Contrasting these natural fibers is the space blanket. Originally developed for NASA to be used on space missions, it’s made of plastic, vacuum-metallized film—one of the most unusual materials ever invented. The space blanket has taken on a new earthbound meaning as it is increasingly seen being used for humanitarian efforts to relieve the refugee crisis. Often used in emergencies, this flyweight blanket can provide warmth very quickly in severe conditions. Blankets can double as a universal form of attire draped as wearing blankets. The 10 on view in Global Warming are arranged on a round platform, echoing the globe, without a beginning or end. Each blanket is wrapped on a body form, facing inward as if in conversation, a huddle, as an occupying member of a unifying team. They blanekts, woven on a variety of looms, range from understated banded stripes to intricately and meticulously patterned motifs. Seen from the back, these empowering emblems or insignias are devices of cultural identity. Manipulating the warp (vertical) threads and the weft (horizontal) threads can be very simple or extremely complex. Supplementary threads add color, inserted with precision for recording history. For many weavers, the memory for pattern lies in their hands, rarely relying on the written word to document these legacies. Dying the threads before weaving offers another way to instill honor, prestige, or sacredness to these cloths. Pua kombu ikat (tied and dyed threads) from Borneo capture the Antu Rimanung or the flying tiger spirit. Warriors sleeping beneath a cloth such as this gained ties to the spirit world. Colors can also convey a message that is immediately recognizable, as delineators of age, indicators of seasons or signaling good fortune. Natural dyes such as indigofera tinctoria for blues and morinda citrifolia or cochineal for reds are dominant hues. One can only wonder why these two primary colors prevail throughout history, spanning centuries and continents. The availability and acquisition of dyestuffs impacted trade and commerce. Transitions are marked by the inclusion of synthetic dyes—bright and electric with a range of hues, altering the color palette and influencing a shift in calculating prestige. Clever application of an introduced color source is seen on the kapa moe. 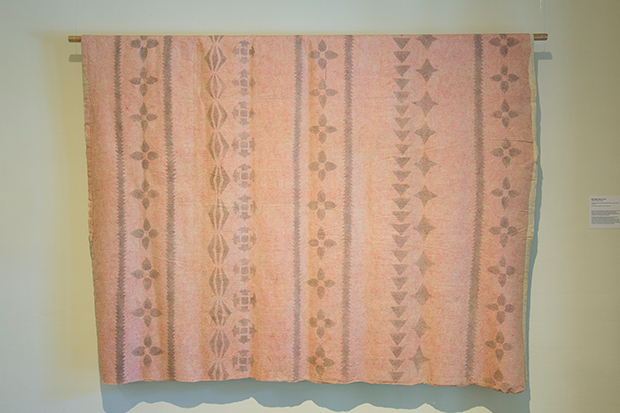 Red cotton cloth was macerated into a pulp and beaten into the wauke, producing a soft pink, marking a transformation of tradition. Global Warming: Quilts, Coverlets and Blankets highlights textiles that go beyond the need for protection by paying tribute to these makers and the artistic excellence that they represent from around the world.